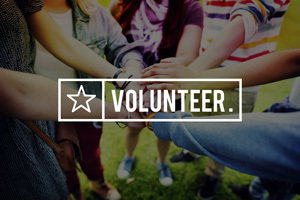 We extend heartfelt thanks to the donors who established and continue to support our scholarship funds to assist young men and women pursuing education in healthcare. Violet B. Hanna Memorial Scholarship Awarded! 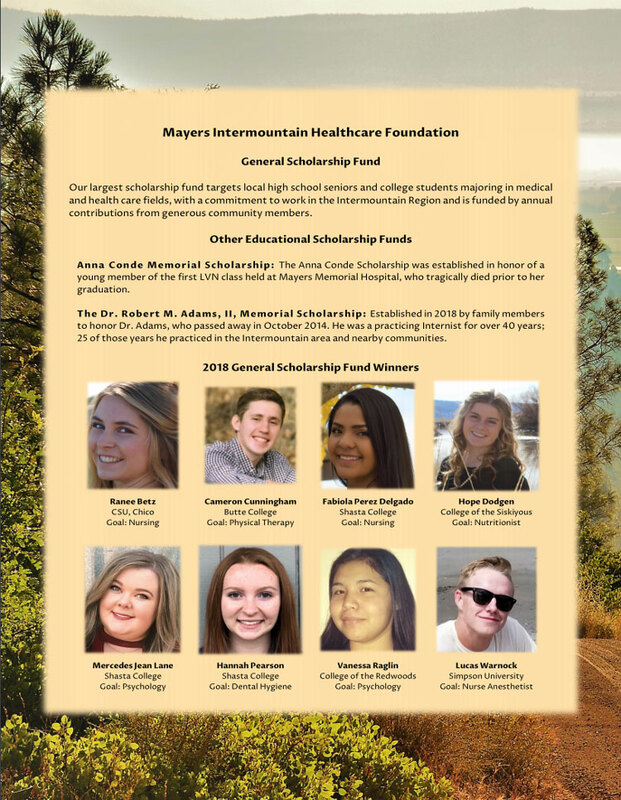 The Mayers Intermountain Healthcare Foundation has named Elizabeth Haydock as the receipient of the Violet B. Hanna Memorial Scholarship. Ellie was accepted into the nursing program at Chico last December and is scheduled to graduate May 2017. On October 10, 2016, Dave and Ginny Hanna presented Elizabeth Haydock a $7,500 check to use toward her nursing education. In 2015, Ellie was the recipient of the $15,000 Violet B. Hanna Memorial Scholarship and was awarded $7,500 as a partial payment based on conditions to receive the final $7,500 scholarship funding the following year. Ellie fulfilled those conditions and is now completing her final two semesters at Chico State University before graduating in May 2017 with a Bachelor of Science degree in nursing (BSN). 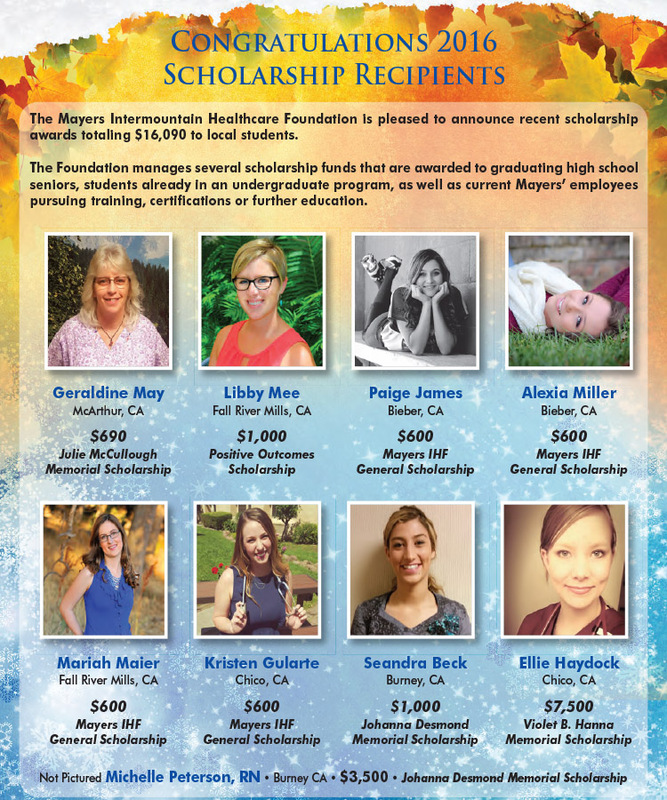 Upon completion of her education and committing two years of full-time employment at Mayers Memorial Hospital as a registered nurse, she will receive an additional $2,750 award from the scholarship. The $15,000 scholarship was established in 2014 at the request of Dave and Ginny Hanna to honor Dave's mother, Violet B. Hanna, who passed away July 10, 2014, 13 days before her 101st birthday. She and her husband, Bill, were married 65 years and spent much of their leisure time during these years in the Fall River Valley. 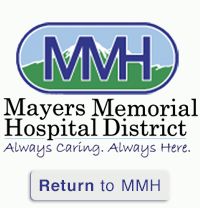 They were generous contributors and supporters of Mayers Intermountain Hospice. Born in Los Angeles, CA on July 23, 1913 to Albert Wogatzke and Ella Bussjaeger, Violet was the oldest daughter of nine children. She married William Hanna on August 6, 1936, lovingly raised a family of two children, has seven grandchildren, and six great-grandchildren. She enjoyed wonderful health all of her life. Violet witnessed momentous changes in our nation's history. Her life reflects a contribution to that history. She was raised on a farm, was a straight A student and was so devoted to family that after graduating from High School in 1931 she gave up a full scholarship to Occidental College to start working in Los Angeles to support the rest of her family in Imperial Valley, CA. Through the generous contributors that have honored Violet B Hanna, and especially to Dave and Ginny Hanna, the scholarship was created to address an increased need for qualified nurses in our rural area and to invest in the community by providing career opportunities that support rural healthcare.